You can almost feel the tropical breezes as you enter the room. The Martinique Lined Empress Swag hosts a restful palette of color, with windswept tropical leaves and flowers done in shades of taupe, green, and goldenrod, against an watery blue background. A coordinating taupe piping frames the graceful scalloped edges along the bottom of the swag adding just the perfect finishing touch. One pair of swags will cover windows from 36" to 60" in width. 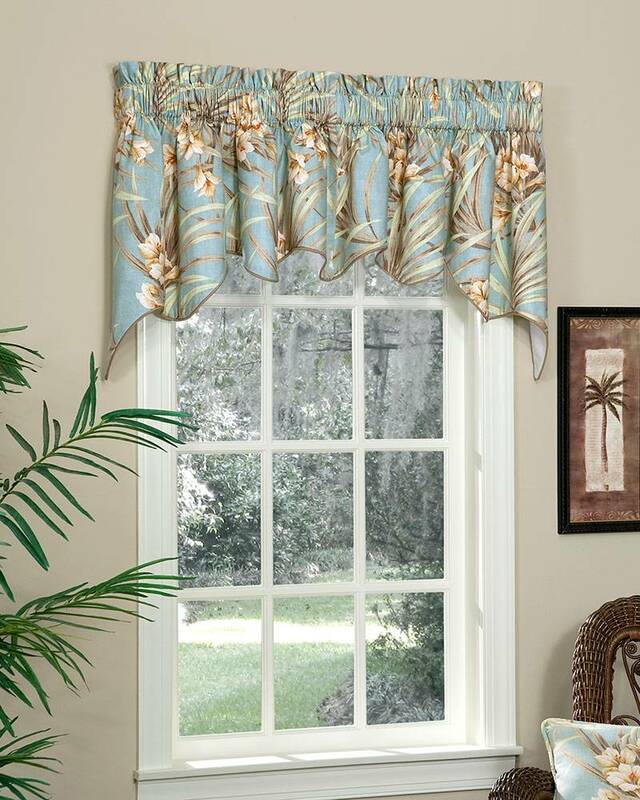 For wider windows, and for multiple windows that are being treated as one window, combine with Martinique Lined Empress Filler Valances (sold separately) - insert Filler Valances between the right and left swag panels. Swags are fully lined for protection from harsh sun. Made in the USA.